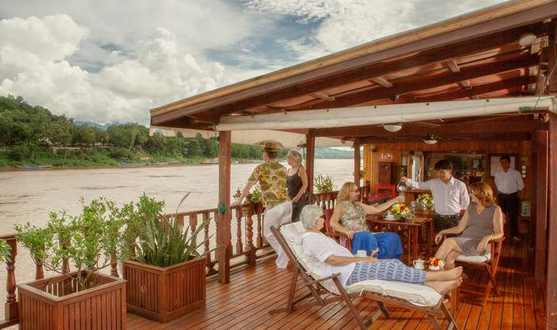 In the afternoon, you will embark on the Mekong Sun or Mekong Pearl, a comfortable Laotian cruise ship. These unique vessels are the first German-Laotian owned river ships with cabins on the upper Mekong. Settle into your accommodating cabin and unpack for a five-day cruise. (Check-in is at noon). Shortly after embarkation, your vessel starts for your spectacular river cruise upstream into formerly inaccessible parts of the Mekong river. The night is spent on a beautiful sandbank, surrounded by nothing but pure nature. Enjoy the spacious decks, lounge on board and attend your welcome reception and dinner this evening. A selection of Asian and European food will be provided throughout the cruise. Further north you will discover some of the most remarkable, most impressive landscapes of this still-untamed river. The landscape becomes more and more spectacular: hills covered with tropical vegetation, awe-inspiring rock formations along the river banks, and a fascinating array of fast currents and slower river parts. 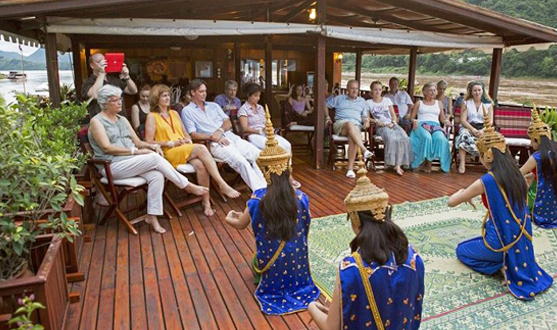 The power of the mighty Mekong will give your cruise the feeling of a real expedition. Enjoy the beautiful views and watch nature’s wonders along the riverbanks before you head north again and stop at a remote sandbank for the night. Overnight on board. Meals included: breakfast (B), lunch (L) and dinner (D). Upstream you will stop at the small riverside community of Pak Lai, known for once possessing many colonial buildings. The purely natural landscape is only broken by the seldom sights of small villages and local herds of cattle. Enjoy the comfort and service onboard: exclusive, yet casual, you’ll share the boat with no more than 26 fellow guests. During and after breakfast on board, enjoy the beautiful view and possibly watch local fishermen along the shore. You will see the Mekong ferry crossing at Tha Deua, connecting Luang Prabang province with the Sayaboury province. After passing Xayaburi embankment dam, you will meet the inhabitants of a small village which is regularly visited by our guests and supported by donations. A shore excursion will take you to the Kuang Si-waterfalls, some of the most attractive waterfalls in Laos. 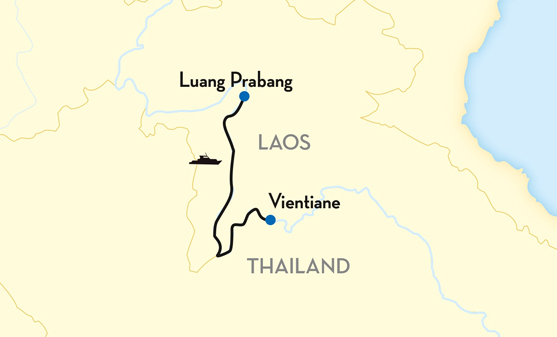 This afternoon you will reach Luang Prabang, the former royal capital of Laos, now a UNESCO World Heritage Site. In Luang Prabang you will say goodbye to your Lao crew. Cruise Price: On Per Person basis on Twin sharing & Validity March 2020. 5 overnights in selected cabin type aboard your boutique river cruise vessel. Entrance fees for sightseeing mentioned in the itinerary. Excursions as mentioned in the itinerary. Tours and transfers as mentioned, by air-conditioned vehicles. Water in the vehicles and on the ship. Meals as indicated in the itinerary (B= Breakfast, L=Lunch, and D=Dinner). Coffee, tea, and table water during meal times on board your boutique river cruise vessel. Presentations and lectures on board by the cruise director. Transfers from / to Vientiane and Luang Prabang airports or hotels within city limits (only guaranteed if information was correctly provided 4 weeks prior to embarkation, at the latest). Meals and services other than those noted in the itinerary. Laundry, telephone calls, and personal expenditures. Gratuities for guides, drivers, porters, boat crew, and personal, non-itinerary services. Alcoholic and soft drinks other than mentioned. Non-refundable deposit of 15% is due after the reservation. Sailing dates can be changed due to unforeseen circumstances.